Community college is home to a diverse student population with different stories and backgrounds. Some come straight out of high school, others are returning from the workforce and many have children of their own. Administration is aware of this diversity and tries to minimize the stressors in the life of particular students — those who have children at home and in need of child care. As student-parents at ARC strive to get their education the Child Development Center offers a child care program for toddlers, preschoolers and school-aged children. They must be at least two years old to enroll in the program. The center is located behind the campus cafeteria and bookstore. Inside, classrooms are full with art supplies, wooden play structures, stuffed animals and books. A playground is adjacent to the front entrance and a courtyard is home to a garden, bunny and two chickens. Michelle Kiefer the center’s supervisor, says the courtyard is one of the children’s favorite places to explore. According to the Child Development Center pamphlet, the program has different learning objectives for each age group. Among these the primary goal at the center is to nurture the children in an environment that develops as well as encourages their success and learning. According to Kiefer, the building which houses most of the center’s resources has been around for 16 years, and has not only offered child care for student-parents, but for employees on campus as well. Approximately 135 families are enrolled, and approximately 95 percent of parents are currently students on campus and 5 percent are either employees or former ARC students, according to Kiefer. The center also offers an opportunity for early childhood education lab students to work in the center as teacher aids and volunteers. “We support the [early childhood education] lab students so we typically have between 70 and 90 … students who come here twice a week and they do their lab hours in conjunction with their academic classes,” Kiefer said. These lab students assist teachers in a variety of activities. Paige Hall has been a student at ARC since 2016. Her 3-year-old son has been enrolled in the childcare program since she started college and her 2-year-old daughter since 2017. She explained the different activities her children are involved in while she goes to class and works during the day. 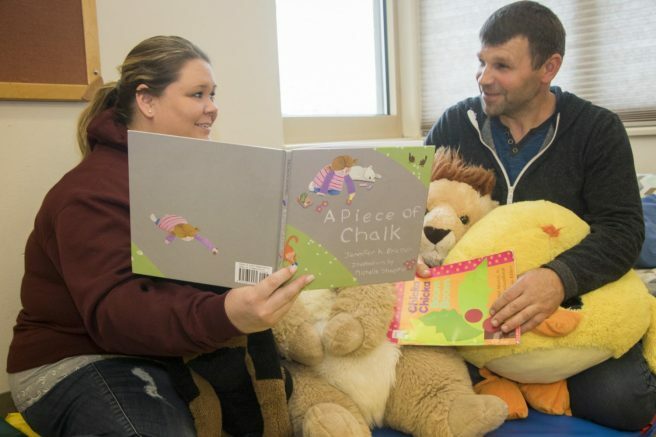 “They do a lot of painting and sensory stuff and they try to teach them more to ask for stuff instead of crying because … they are still babies so they are trying to communicate,” Hall said. She says she is grateful for the daycare because it has alleviated some of her worrying. Application packets are available in the front office. Although the application process is lengthy, Kiefer says that it is worth it. The staff also offers resources for those families who may need the support. Their philosophy is that communication between parents and staff will meet the children’s needs which is their priority. The center is funded by the state of California and, according to Kiefer, it is the reason why there are so many papers to fill out. The Department of Education sets a sliding scale according to the income and the size of each family. The fees are paid in advance and a payment notice is given before the due date. Be the first to comment on "Child Development Center helps student-parents"